Who doesn’t love a simple, yet powerful, coaching tool?! 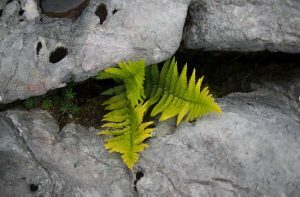 I’m always looking for fresh approaches and elegant frameworks for helping my coachees navigate their personal journey. And the WBEC’s Narrative Coach (NC) program with Dr. David Drake provided a virtual treasure trove of tools, conceptual constructs, and frameworks for working with coachees and their stories in a unique and insightful way. I’ve seen an enormous number of tools in my 15 years of coaching, and the one’s I’ll share here, I’ve found to be easy to understand, extraordinarily clarifying and simple to implement. This is the third and final blog post related to my reflection on the NC Program. In Part 1, I shared the insights I gained about myself as a coach while experiencing the program. In Part 2, I shared the assumptions about coaching that have shifted for me. Here I’ll share the five pieces of content from the program that I found most valuable, and why I believe they are so useful. Note: 100% of this content was created by Dr. David Drake and should you choose to share this with clients or create your own version (as we coaches love to do), please ensure you give proper credit to Dr. David Drake and Narrative Coaching. Also, I did my best to distill the essence of the tool without taking too many liberties or short cuts. And for the exact words, questions and context, buy his book and/or take the course. You’ll discover that all of these simple tools and approaches meet the coachee where they are and focus on their story as a generative aspect of the coaching. Many of these tools may feel familiar, and you’ll notice an emphasis on the coachee’s present moment experience, the stories they tell and the identity of the coachee in their stories. This is my fave of all of the tools because it links so beautifully with the EQ Profile. When we are preparing a coachee for the session in which we’ll debrief their EQ Profile results, we ask them to recall and bring to the session 2-3 specific stories of interpersonal conflicts. We use the narrative in the coachee’s stories to map to the patterns revealed in their EQ Profile. The EQ Profile reveals patterns of thinking, feeling, wanting, sensing and focusing that are vestiges of adaptive strategies spawned by our lifetime of relationships and experiences. 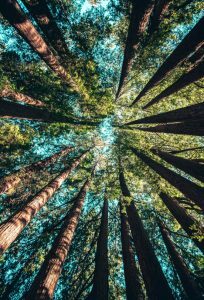 These default patterns become a common denominator of many of our interpersonal conflicts until we become aware of them, and create new, more conscious ways of being and behaving. This simple, yet powerful tool supports the coachee in reflecting on the stories they tell about interpersonal conflicts and the patterns which may be inherent within them. Further, it facilitates the development of a new, more intentional pattern that supports who and how the coachee wants to be. I hear an echo of the Ladder of Inference in the first half, to be sure. And the second half is a kind of walking back down the Ladder. And adding the question about identity amps up the insight that’s available here. It takes this set of questions from simply an examination of the stories we make up to who we are that we make up these stories. The second half starts with classic Covey, beginning with the end in mind (but how often do we actually do that in the middle of an interpersonal conflict?). And this begins the intentional process of re-patterning our seeing, thinking, being and doing to align with what we want. One of the big differences I’m noticing about Narrative Coaching and how I’ve learned to coach is the bias toward examining the coachee’s present moment experience. (Of course, that’s an aspect of most all coaching, and my sense is that Narrative Coaching gives it more weight and returns to it more frequently). 1) What is true and important for you now? 2) What is your motivation to do it differently? 3) How will you remember this new story? 4) What else do you need to get started? 5) How will you know you have been successful? Notice how all of the questions in Circle One are about the coachee’s present experience (about a past experience). There’s nothing about what the coachee wants to be different or where they want to go or what they want to create – all aspects that are often at the front of so many coaching models. Notice how Circle Two stays with what’s present for the coachee to organically generate what new wants to emerge. Circling the Tree is actually a lot like the Rewind Tool. Both give our coachees a way to examine their internal narrative relative to what they want for themselves. And the Circling the Tree stays more with what’s present for the coachee now. 1) Bring a stack of 7-10 index cards to a coaching session. 2) Invite your coachee to talk about her issue or question. 3) As she does, write the words or phrases that carry the most weight or energy on to the index cards. 4) Give the cards to the coachee and invite her to place the cards in the order represented by the story. 5) Then, invite the coachee to move the cards to a new configuration and notice what comes up. 6) Invite the coachee to continue to experiment until the resolution becomes clear. 7) Invite the coachee to imagine what it would be like and what it would take to live from this place. 8) Invite the coachee to talk about the implications of the outcome and anchor it as needed. I can’t wait to try this. Sounds like fun. As your coachee presents a challenge they are having, work with them to identify what they want and articulate their old story about the challenge. Then work with them to create a new story that surmounts the challenge. I’ve seen a number of similar models and this Vectors of Change model feels more complete and integrated than any I’ve seen. And it’s so simple. 1) Listen attentively when your coachee shares a challenging situation. Explore the coachee’s thinking, feeling, wanting and believing about themselves, others and the situation. 2) Ask your coachee, “What is another perspective you could take?” Explore what that perspective enables them to see, feel, think, believe. 3) Continue asking “What is another perspective you could take?” Don’t be afraid to be creative here. Why this way of seeing things? How does seeing it this way impact you? How else could you see it? What do you gain from seeing it this way? What keeps you from considering this possibility? What do you lose by seeing it this way? What might you gain if you did? The bottom line is that simple questions about the perspectives of people and entities important to her helped her fill in what was missing in her own perspective so that she could see her situation and herself more clearly. I hope you find these tools as useful as I have. I’d love to hear what additional questions or comments you have. And if any of this needs more context, let me know. I’ll do what I can to provide it. Do you have favorite tools you love? If so, let me know. If I get enough interest, I’ll do another blog on favorite tools. P.S. Want to receive our blogs in your inbox? Subscribe to our Friday Conversations Blog. P.P.S. Do you struggle to understand your coachees sometimes? Do they struggle to express themselves in ways you both understand? The answers are all in their languaging. And there’s a course for that. 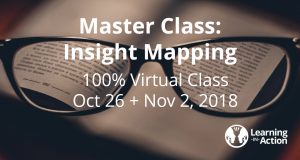 🙂 Join us for our virtual video course, Insight Mapping. Learn how to listen for the clues that are right in front of you. (And no, neither you nor your coachees need to know anything about the EQ Profile – although this course will enlighten those who use it, too!) Click here for details and to register. Not an EQ Profile practitioner? Click here for information on the EQ Profile. Too much to chew on? Click here for a Taste of the EQ Profile. What are you sure you know about coaching? I thought I knew a lot about coaching after 15 years and over 5,000 hours of experience. And in the past year or so, I’ve realized that a lot of what I thought I knew, my assumptions, were horse S#$%. In my last blog post, I shared Part 1 of a reflection assignment due as part of the WBECS Narrative Coach (NC) Program with Dr. David Drake. 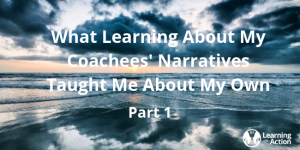 In this Part 2, I share how what I thought I knew about coaching has been turned on its head by my experience with Narrative Coaching. 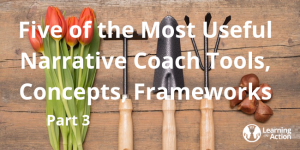 All of my coach training prior to the NC Program has been in a largely co-active approach to coaching, firmly grounded in ICF core competencies. 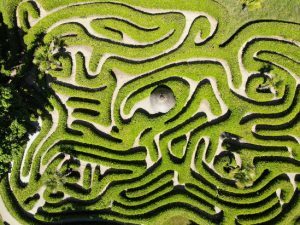 And while Narrative Coaching certainly doesn’t throw the ICF competencies out the window, it takes a very different approach to coaching than what I’ve learned in the past. Coaching starts with a contract/agreement. Early on in my coach training, I learned that the first thing to do as a coach is figure out the contract or what it is the coachee wants. The problem is, in my experience anyway, the coachee almost never knows what they truly want until it’s uncovered by the coaching. And when I’ve focused early in the relationship or early in the coaching session on getting to what the coachee wants, I’ve ended up chasing a red-herring, spending time at the surface and/or on the wrong thing. I’ve learned that what the coachee says they want is only one aspect (and maybe a small one) of their larger, deeper desire, which is only ultimately discovered through the work. Even in the Advanced Coaching Program I took, we spent a great deal of time and energy around securing the coaching session agreement by checking the boxes of Topic, Desired Outcome, Meaningful Underlying Issue and Success Measure. And I bought into that at the time, and to an extent, I still do. Only now it feels more like an artificial structure placed on an organic process. (More on that below). The coach provides the structure and the process. The coachee provides the content. To an extent, I still believe this – and now I see it differently. I used to feel responsible for figuring out the most robust and efficient series of questions that would bring the coachees the insights, clarity and resolution they were seeking, based upon what they said they wanted. Now, that feels to me like an artificial construct placed on a natural process. These days, I see coaching as the facilitation of an innately organic process. I believe that our coachees are all almost always, consciously or unconsciously, working to resolve what they bring to coaching (that’s what brings them to coaching). And my role isn’t to lead them down the path of questions that will ultimately get them to their answer. My role is to be present with them, see them, explore with them where they find themselves and then remain alert for the indications of where, why and how they are wanting to move from where they are to a new state of being. Better questions make for better coaching. While I believe this is true to an extent, I’m no longer so focused on how to figure out the right, best questions. Because when I focus on figuring out the questions, I’m in my head and not with my coachee. I’m not present. I now believe that it is greater presence that makes for better coaching. The more present, the more in the moment, I can be with my coachee, the more I can attend to, encourage and facilitate the coachee’s own organic progress. That said, my understanding from those coach trainings has been that even though we want to partner with the coachee (just like in a dance), the coach is still supposed to lead. And the way the coach leads is through their questions. And where the coach leads is where the coachee says they want to go. But if the coachee doesn’t truly know where they want to go…… where are we leading them? In my prior coach trainings, as if to emphasize the importance of partnering with the coachee, the coach trainers would recommend frequently checking in with the coachee to determine if the coaching is on track and/or where they want the coaching to go. That made sense to me at the time. But here’s the deal: In my experience, not only do my coachees not consciously know what they want, they are often resistant to directly confronting the challenge ahead of them. And if I ask them where they want to go, they will often avoid exactly where their organic process is taking them. So what’s the answer? If we are not leading and we are not partnering, what the heck are we doing? P.P.S. Are there more blank spaces on your coaching calendar than you’d like? Join Chip Carter, Senior Advisor at the Institute of Coaching, and Alison Whitmire, president of Learning in Action, for September’s interactive webinar of discussion and Q&A around your coaching capacity and how you can fill your calendar in a number of ways, including coaching for organizations who need you! Register here – FREE. Last year, I registered for WBECS’ Narrative Coach Program with Dr. David Drake. I had been hearing about David and Narrative Coaching and was curious about how we might apply his approach to help coachees make meaning of their EQ Profile results. For the uninitiated: The EQ Profile provides a snapshot of one’s internal experience under stress in relationship. It reveals the patterns of thinking, feeling, and wanting that are triggered within us during interpersonal conflict. And because we often aren’t fully aware of our internal experience, it can sometimes be challenging to relate to our EQ Profile results. After debriefing EQ Profile results with hundreds of coachees, I’ve learned that we are all, always narrating our internal experience (whether we are aware of it or not). 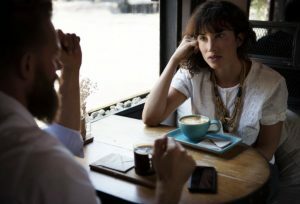 And one of the best ways of helping a coachee see the aspects of their internal experience that are hidden to them is to ask them to tell a story about a specific interpersonal conflict. I’ve found that as I listen deeply to a coachee’s story, I can hear the dimensions of their EQ Profile in their language. (Which is what our Master Class: Insight Mapping course is all about.) Because this is now second nature to me, I was curious what more I could learn about a coachee and their story through Narrative Coaching. And learn more I did. This gives you a pretty good sense of what the first seven months of the Narrative Coaching (NC) Program were like. Exhaustive and exhausting. And incredibly rich, brilliant and challenging. While I entered the NC Program to learn more about how we could help coachee’s make meaning of their EQ Profile results, what I came away with was a dramatically different view of coaching overall. In Narrative Coaching, I’ve found a much more organic, natural approach to working with coachees that feels less formulaic than what I’d been taught previously. I’d like to share with you what I learned from the NC program, so you are now my “friend who coaches”.  And because I want to stay friends, I’m not going to cover all of the bulleted items above. And I’ll cover several of them over the course of this multi-part post. I hope you find it useful. So all of that is context for what I learned about myself, as a coach, as a human, over the duration of the NC Program. Also, it had been a while since I’d stepped back and observed myself as a coach, so that is reflected here, as well. I am who I say to myself I am. And that’s true about myself as a coach and in every other aspect of my life. If I say to myself that I’m not enough as a coach, that I’m not creating enough value for clients, that I can never be worth what they pay me, then that will be true for me. And I will embody that identity. I will stay small. And safe. And fortunately, the opposite is also true. If I say to myself, “I am enough and everything I need lies in the space created by my client and me,” then that will be true. And it opens up more possibilities for both of us. Forming a secure attachment with my clients is my first priority as a coach. When I’m able to form a secure attachment with a client, our relationship becomes the safe haven in which they show up as themselves and are seen and accepted. Our relationship creates the secure base from which they safely explore new territory. And our work can help them create new mental models that support their self-development. And while we at Learning in Action have been talking about attachment theory for more than a decade as it relates to the EQ Profile, only through the NC program have I been able to see how clearly the concept of secure attachment applies to my coaching. Having a client feel like our work is fun is its own reward. Because when my clients are having fun, they are experiencing something different, something new, and they are more likely to see something different and new about their situation and themselves. I hope that my reflections about me encourage you to reflect on you. Because what I get about you, my partners and colleagues in this noble work we do, is that you, like me, want to be better, do better, learn more, love more, be more for your coachees. And that can only be good for us, our coachees, and the ripple effects on the world. Stay tuned for Part 2 next week on Reflections on Narrative Coaching. Until then, have fun! Join Chip Carter and Alison Whitmire, president of Learning in Action, for discussion and Q&A around how to think about your coaching capacity, how coaches can fill their capacity in a number of ways, how coaches can think about coaching at different price points. – Should I reduce my rates to get more clients? – Would I get more clients if I reduced my rate? – How much time should I be spending on my existing clients versus finding new ones? – What are all of the options for finding new clients? – What would optimize my financial and other goals? – How much coaching per week do I want to do and how can I fill my calendar to my chosen capacity? Attendees will leave with their own answers to these questions, and more, so they can best coach to their own capacity. Chip Carter is a Senior Advisor, Strategy & Expert Network at LeaderJam. His expertise includes coaching, technology, business process, marketing. Learning in Action’s monthly podinars are moderated by Alison Whitmire, president of Learning in Action. – THIS PODINAR WILL BE RECORDED. REGISTRANTS RECEIVE RECORDING and notice of future podinars. I had an idea of what was wrong and there wasn’t a quick fix. As part of our work together, Bill had taken the EQ Profile (an instrument that reveals our internal experience when challenged or under stress). I had coached Bill for almost a year and it was clear (both from our work together and his recent EQ Profile results) that he had limited access to his own emotions, a nearly empty joy bucket, little to no ability to empathize, and was easily triggered. What is Emotional Thinness (ET)? Emotional thinness (ET)? (Never heard of it? I made it up. :)) You’ve met people ailing from ET and perhaps labeled it something else. It’s a difficulty in producing relational connective tissue. 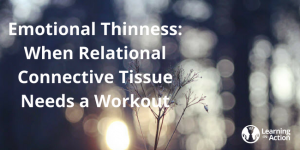 Just as connective tissues like ligaments and tendons provide structure and support for our bodies, authentic and sensitive conversations, empathetic compassion and meaningful collaboration make up the relational connective tissues that provide support and structure for our relationships. ET sufferers don’t easily produce these things. When you engage someone with ET, you’ll notice, consciously or subconsciously, a lack of warmth from him or her. It’s particularly noticeable in a group of people, say, at a party. You may steer clear of them because they may “flatten” your mood. That’s not to say someone with ET walks around mean or cold or angry or negative. In fact, they may be smiling and happy. And your interaction with them may have a distant, transactional or distracted quality to it and your conversation may be shallow and without meaning. ET is somewhat rare among CEOs because relationships are so important for developing a stable and productive work force and having successful customer relationships. And sometimes simple brute force, an intense work ethic or dynamic energy can overcome the fairly significant drawback of emotional thinness. The causes of ET are too varied and complex to describe here. It’s fair to say that ET sufferers probably didn’t have warm, secure, attuned relationships with their primary caregivers. That’s not to say they were abused or neglected. Just that they didn’t experience that relational connective tissue they needed in order to know how to produce it. To overcome ET, what do you do? Connecting with others starts with connecting with yourself. The right coach or a therapist can help you better understand yourself. Also, EQ assessments like Learning in Action’s EQ Profile can help you see the emotions you experience and those you don’t access, measure your ability to empathize and see things from others’ perspectives. Such instruments can help you access and understand your internal experience, and then provide you with choice as to whether or how you act on it. Only by understanding yourself can you make the changes you need to establish relational connectivity and create the meaningful relationships that can withstand minor setbacks and what I call the thousand tiny paper cuts of being in relationship. For most of us, our internal experience is the wallpaper of our lives, something we don’t directly look at, see, think about or question. It just is. And often once we do examine it, we can easily justify it. We’ve consciously or nonconsciously spent a lifetime constructing it.It’s how the child in us learned to survive and defend itself. And that child isn’t always the best person to trust in a relationship under stress. Most of us don’t magically transform overnight, and neither did Tom. He was quite shocked and confronted by his EQ Profile report. And initially, he pushed back mightily on his results. He didn’t see himself as emotionally thin at all. He saw himself as generally happy and optimistic with some good relationships. However, the EQ Profile provided him with a snapshot of what goes on inside of him when he is stressed (which was a lot of the time in his role as CEO of a struggling company). And once he accepted the truth of it, he was able to understand why people reacted to him the way they did. And why small issues quickly became big ones. The EQ Profile provided Tom with an awareness about himself that was new and impacted his entire life. Like all of us, he took his internal experience with him everywhere he went. And understanding that experience – his gut reactions, his tendencies, the emotions he did and didn’t access, his focus, his beliefs about himself and others – empowered him with the information he needed to know about himself to begin to make more relational choices. Sure, Tom and I regularly revisited his EQ Profile results in our coaching sessions over the next two years. And we did so because his internal experience (as illustrated by his EQ Profile results) continued to show up in the issues and challenges he brought to our work together. By reflecting on and understanding his own internal experience, doing more to fill his own joy bucket and looking for his own contribution to any given interpersonal conflict, Tom began to develop compensating strategies that allowed him to become more relational and more connective. P.P.S. Sometimes we need to break the rules to forge ahead. Learn why it’s important for the success of your coaching business. Register for our July 31st podinar, “Unlearning Coaching: Challenging ‘the Rules’ to Do More of the Coaching We Love.” Did we mention it’s FREE?